South Korea has emerged as the largest international market from the Philippines and the largest source market for the Philippine tourism industry. South Korea has helped drive rapid growth in international traffic from the Philippines this decade along with rapid visitor growth. South Korean visitor numbers to the Philippines have tripled over the past eight years. More than 1.6 million South Koreans now visit the Philippines annually. While five Philippine airports are connected with South Korea, Manila and Cebu dominate the market. The Cebu-South Korea market has particularly grown rapidly, and South Korea now accounts for 60% of total international traffic at Mactan-Cebu, the Philippines’ second largest airport. South Korea is the Philippines’ largest international market and the largest source market. South Korean visitor numbers to the Philippines have tripled in the past eight years. Philippines-South Korea seat capacity has nearly doubled over the past seven years. There are 11 routes from the Philippines to South Korea, connecting five airports in the Philippines with four airports in South Korea. There are 12 airlines serving the Philippines-South Korea market, including seven LCCs. The rapid growth in the Philippines-South Korea market will be discussed at the 2019 CAPA LCCs in North Asia Summit, which will be held in Cebu on 24/25-Jun-2019. There are currently approximately 50,000 one-way weekly seats from the Philippines to South Korea. South Korea accounts for approximately 15% of total international seat capacity from the Philippines. Philippines-South Korea capacity has nearly doubled over the past seven years. In Sep-2011 there were 28,000 one-way weekly seats. Philippines-South Korea is a highly seasonal market. The peak period for travel is late December to March. Philippines-South Korea capacity exceeded 60,000 weekly seats for the first time during the peak season last winter. In winter 2011/2012 capacity peaked at an average of 35,000 weekly one-way seats. The Philippines is one of the most popular destinations for South Koreans, accounting for 6% of total outbound South Korean travellers in 2017. The Philippines is the fifth largest international market from South Korea after Japan, China, Vietnam and the US. The Philippines accounts for an average of 5% of total international seat capacity from South Korea (the exact figure varies slightly depending on the time of year). South Koreans accounted for 24.3% of all visitors to the Philippines in 2017. South Korean visitor numbers to the Philippines have more than tripled over the past eight years – from less than 500,000 in 2009 to more than 1.6 million in 2017. In 2009, South Korea accounted for only a 16.5% share of total visitors to the Philippines. South Korean visitor numbers have increased by at least 9% for seven out of the past eight years. 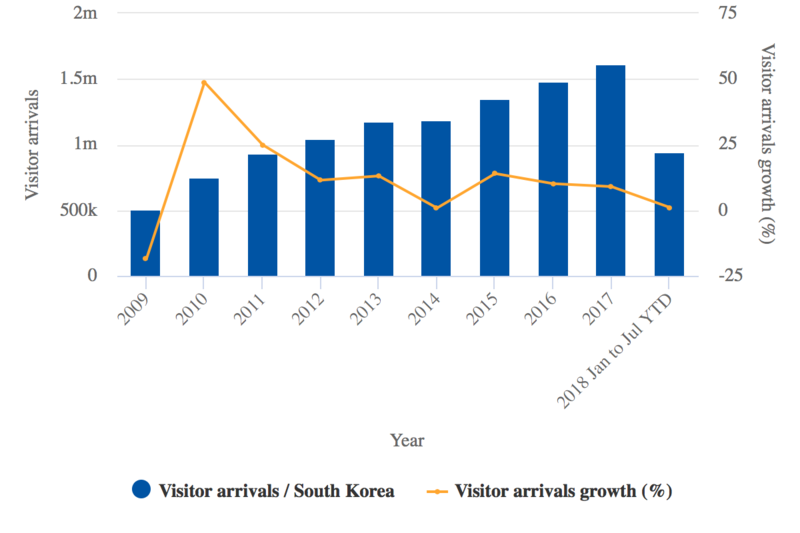 However, South Korean visitor numbers were up by only 1% in the first seven months of 2018. Source: CAPA – Centre for Aviation and Philippines Department of Tourism. Visitor numbers this year have been impacted by the closure of Boracay Island, which is one of the most popular tourist destinations in the Philippines. Boracay is closed for six months – from Apr-2018 to Oct-2018 – for an environmental clean-up. South Korean visitor numbers to the Philippines declined in the March to July period after increasing by 16% in the first two months of 2018. Kalibo, the international airport serving the Boracay market, is usually one of five international airports in the Philippines with services to Korea. However, all international flights at Kalibo (and most domestic flights) are currently suspended due to the closure of Boracay. Cebu Pacific, Philippines AirAsia (PAA) and Philippine Airlines (PAL) are planning to resume services from Kalibo to Seoul when Boracay reopens in late Oct-2018. PAA and PAL are also planning to resume service from Kalibo to Busan, the second largest city in South Korea. Manila Ninoy Aquino International is the largest Philippine airport for South Korean traffic, but Mactan-Cebu International is only slightly smaller. The other three Philippine airports currently handling flights from South Korea are Clark, Puerto Princesa and Tagbilaran. However, Puerto Princesa has only attracted flights to South Korea since the closure of Boracay, and PAL is planning to stop operating from Puerto Princesa to Korea when Boracay reopens (as that capacity is shifted back to Kalibo). Clark is a fast growing alternative airport to Manila, while Puerto Princesa in Palawan and Tagbilaran in Bohol are emerging alternative beach destinations that are starting to become popular with South Korean travellers. Puerto Princesa opened a new international terminal in 2017 and will likely attract a permanent route to South Korea in the near future. Tagbilaran is about to be replaced by the new Bohol International Airport, which will likely attract several South Korea services over the next few years. It is no surprise that Manila and Cebu account for most of the Philippines-South Korea traffic, given that they account for more than 90% of total international seat capacity from the Philippines. However, Cebu is punching well above its weight when it comes to South Korea. While Manila has seven times more international traffic than Cebu, Manila has only slightly more traffic from Korea. Cebu-South Korea capacity has doubled over the past seven years, whereas Manila-South Korea capacity has increased by less than 20%. Korea accounts for approximately 60% of Cebu’s international seat capacity and has contributed to rapid international traffic growth. As CAPA highlighted in an Aug-2018 analysis report, Mactan-Cebu Airport’s international passenger traffic has more than doubled over the past four years. The airport is on pace to handle 3.7 million international passengers for the full year in 2018, compared to 1.7 million in 2014 and 1.2 million in 2010. Six Korean airlines serve the Cebu-Korea market, along with four Philippine carriers. Jeju Air is the largest foreign airline at Mactan-Cebu by capacity and currently operates two daily services from Seoul, along with one daily service from Busan. Jin Air, Korean Air and Air Busan are also among the six largest foreign airlines in the Cebu market. Cebu and the Central Visayas are popular destinations for Koreans. Cebu also attracts significant South Korean traffic heading to secondary and tertiary destinations in the Philippines. Mactan-Cebu has more than 25 domestic destinations and provides passengers with a better transit experience than Manila. Philippines-South Korea is mainly an inbound market. In 2017 there were less than 450,000 Filipino visitors to South Korea, compared to more than 1.6 million South Korean visitors to the Philippines. South Korea has a relatively small Filipino population compared to the other main international markets from the Philippines. There are approximately 60,000 Filipinos living in South Korea. Philippines-South Korea services also generate some sixth freedom traffic. Seoul Incheon is a particularly popular transit hub for Philippines-North America traffic. The US has the largest overseas Filipino population and Canada has the third largest. However, most South Korea-Philippines traffic consists of local rather than sixth freedom traffic. Asiana and Korean Air carry a relatively large volume of sixth freedom traffic from the Philippines, mainly to North America, but they account for less than 30% of total Philippines-South Korea capacity. The Philippines-North America market is very competitive, with PAL offering nonstop services to five North American cities and more than 10 North Asian airlines offering one-stop products. The other 10 airlines serving the Philippines-South Korea market (besides Asiana and Korean Air) rely almost entirely on point-to-point traffic – mainly Koreans heading to Philippines on holiday and, to a lesser extent, Filipinos heading to South Korea for holiday or to visit family and friends. The LCC competitors are particularly focused on point-to-point traffic. LCCs have accounted for most of the growth in the market over the past seven years. During peak periods there are now nearly 30,000 weekly one-way LCC seats from the Philippines to South Korea. Seven years ago, there were less than 13,000 weekly one-way seats during the peak season. Two LCCs have since entered the market, and all five of the LCC incumbents have expanded. AirAsia, Jin Air and Jeju Air have expanded the fastest and are now the largest LCCs in the Philippines-South Korea market. Each has close to a 10% share of total capacity and each has the number one position in the market, depending on the time of year. Jin, the LCC subsidiary of Korean Air, has expanded from less than 1,000 weekly one-way seats seven years ago to more than 7,500 seats during peak periods. Jeju has expanded from 1,300 weekly one-way seats seven years ago to more than 5,000 weekly one-way seats currently. AirAsia currently has up to 6,300 weekly one-way seats in the Philippines-South Korea market. All these seats are generated by Philippines AirAsia (PAA), which launched in 2012 and completed a share swap with Zest Airways in 2013, essentially resulting in a merger. Zest was subsequently rebranded Zest AirAsia and was formally folded into PAA in 2016. Seven years ago Zest was still independent, and had between 2,000 and 4,500 weekly one-way seats to South Korea (depending on the time of year). Cebu Pacific, which had been the largest LCC in the market, has expanded modestly but still has a relatively large presence. Cebu Pacific has an average of 5,600 weekly one-way seats during peak months and approximately 4,300 weekly seats during off peak months. Air Busan, Air Seoul and T’way Air all have much smaller presences and another small Korean LCC, Eastar Jet, does not serve the Philippines entirely. Air Busan, Air Seoul and T’way each have less than 1,500 one-way seats and less than 3% shares of total South Korea-Philippines capacity. T’way entered the market at the end of 2016 and Air Seoul at the end of 2017. Air Busan has been in the market for several years but has expanded modestly. Note: Zest AirAsia was originally known as Zest Airways and was not part of the AirAsia Group until 2013. Full service airline capacity has also expanded, but not as rapidly as LCC capacity. Of the FSC competitors, PAL has expanded the fastest, broadly doubling capacity over the past seven years. PAL is the overall market leader, with approximately a 21% share of total Philippines-South Korea capacity – or 24% when its regional full service subsidiary PAL Express is included. Asiana's and Korean Air's capacities have been relatively flat over the past several years, but they still have a large presence in the Philippines and have grown using their LCC subsidiaries. Asiana and Korean Air each currently have approximately a 14% share of Philippines-South Korea capacity. Asiana has nearly a 20% share when its LCC subsidiaries Air Busan and Air Seoul are included, and Korean Air has approximately a 23% share when Jin is included. Pan Pacific Airlines, a small Philippine airline following a charter/leisure model, has also served the Philippines-South Korea market since 2017. Pan Pacific currently operates from Cebu to Seoul and Muan. Pan Pacific also operated from Kalibo to Busan and Seoul before the closure of Boracay. Kalibo-Seoul was the third largest Philippines-Korea route and Kalibo-Busan was the sixth largest before the temporary closure of Boracay Island. However, Kalibo-Seoul was still much smaller than the largest two Philippines-Korea routes – Manila-Seoul and Cebu-Seoul. Manila-Seoul and Cebu-Seoul combined account for more than half of the total Philippines-South Korea capacity. Manila-Seoul has more capacity, but Cebu-Seoul is the more competitive – with service from eight airlines compared to six airlines for Manila-Seoul. There are currently 11 routes connecting the Philippines and South Korea. With the resumption of Kalibo-Seoul and Kalibo-Busan, in late Oct-2018, there will still be 11 routes as PAL is planning to suspend Puerto Princesa to Busan and Seoul when Boracay reopens. Besides Manila-Seoul and Cebu-Seoul, none of the Philippines-South Korea routes are served by more than three airlines. PAL has the most Philippines-South Korea routes (seven) and is keen to add more as international airports at secondary destinations in the Philippines open and expand. However, LCCs will likely continue to account for most of the growth, given that the Philippines-South Korea market consists mainly of price sensitive leisure passengers.